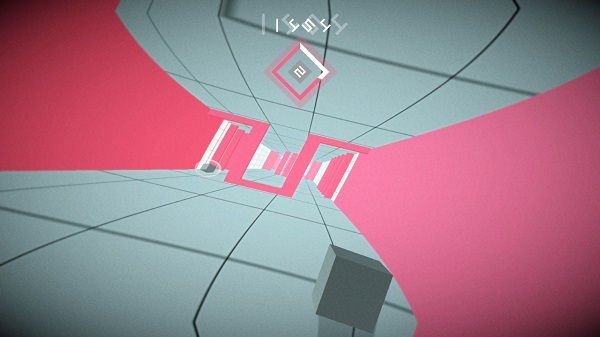 Velocibox puts a new (literal) spin on the endless runner, placing the player behind a fast-moving cube that must be guided down a never-ending tunnel of obstacles you’ll need to slide, rotate and flip past. Oh, and it’s really, really hard, too. Like, super-duper hard. Here’s the thing: Endless runners and games that focus on twitch gameplay are usually jam. I typically enjoy a good challenge, especially one that makes me work over and over again in order to achieve a goal; each reset bringing me steadily closer to that amazing feeling of accomplishment when I finally reach the end. The runner levels in the recent Rayman games and the more challenging courses in Trials: Evolution kept me glued to my television for hour of failing, learning and eventually succeeding. The same goes for games like Dark Souls and Bloodborne, boasting bosses and sections of gameplay that frequently require trial and error to overcome. So having heard some positive buzz about Shawn Beck’s Velocibox on the PC, I was pretty excited to fire it up this past week on the PlayStation 4. In most runners and games with a heavy emphasis on twitch skills, you usually get eased into the deep end. Early levels may be challenging, but they’re usually used as a sort of tutorial to teach you all of the tricks, get you accustomed to the mechanics and give you an early dose of that victory-fueled endorphin rush you’ll be chasing for the rest of the game. Velocibox throws all of that early hand-holding out the window, to the game’s detriment. From the moment you start the game, you’re moving at a lightning-fast pace through a tunnel of obstacles that you need to navigate with pinpoint precision. You can slide your box from side to side and, if you run up on an edge, the level will rotate. You’ll frequently need to hit the X button to completely flip the level, too, which can be extremely disorienting when trying to plan your next maneuver. Controls are a bit floaty, meaning it’ll take some time to figure out how far the box will slide when you lightly press on the thumbstick. Every once in a blue moon I felt like I had a good idea of how far the cube would move in response to my inputs only to find myself not quite making it into a tunnel or accidentally sliding up a wall. The standard game comes with eight levels for players to work their way through. To get from one level to the next, you’ll need to collect a set number of glowing pellets that will be peppered throughout each map. You can start from any level once you reach it, but the obvious goal here is to make it through all eight without failing. There’s also a Super Velocibox mode you can unlock later in the game, but I don’t even want to think about what types of challenges it has in store. There’s also a Ranked mode available for play, leaderboards and trophies for folks who are into that sort of thing. The time it takes you to finish a level is based on how long it takes you to pick up those pellets. On a particularly fantastic run, I imagine you could finish a full run through the game in just a couple of minutes. Don’t get your hopes up, though, as the extreme difficulty means you’ll likely be hanging out on each level for a good long while. At this point, I have only reached level two, and that comes after hours of playing the first level over and over again. My standard runs probably last about five or six seconds, at which point I slam into an obstacle, mash on the retry button and hear that computer-voiced lady smugly inform me that I’m beginning level one again. Obstacles in each map are random, meaning it’s almost impossible to learn from your mistakes and start to build any sort of muscle memory to help guide you through. The obstacles at least seem to be made from a limited set of pieces on the two maps I’ve seen, but the order you’ll face them is always different. That type of randomness usually helps extend the replay value of these types of games but, in Velocibox, it only helped make an already hair-pullingly-difficult game even harder. I’m all for a good challenge, but something about Velocibox’s formula has left me feeling almost mocked rather than challenged. But what really tipped me off to the fact that I wasn’t a fan of this game was that, after beating the first map, I didn’t feel anything resembling a sense of accomplishment. I felt like I had simply thrown myself against a brick wall enough times to finally cause it to come crashing down. As for level two, I still can’t find a groove or get the hang of these new obstacles, and I know it’s only going to get harder from here on out. These types of games usually make me feel like I’ve got to get in “just one more run.” With Velocibox, loading up the game each time felt more like a punishment than a joy. So, no, Velocibox simply isn’t for me. I know there are loads of people playing on Steam who have enjoyed the insane challenge. I’m simply not in this camp, and I’m totally okay with that. To be clear, there’s nothing inherently wrong with Velocibox. It’s got a slick and simple presentation, the game looks good running on the PS4 and the soundtrack is fine. There’s not a lot of meat on these bones, but the price tag reflects that. It’s also nice that failure is one button press away from an instant restart, at least taking some of the sting off of such quick runs coming to an abrupt end. There are folks out there who will lap up this almost aggressively challenging gameplay with a grin on their face. But I wasn’t smiling, and I certainly wasn’t having much fun. This review based on a downloaded copy of the game provided by the publisher.